What is sustainable construction & how is Blue Forest doing its part? ‘Sustainable’, like ‘eco-friendly’, ‘environmentally friendly’ and ‘green’ are terms applied to processes and materials that are manufactured in ways that have a relatively low impact on the environment and pose the lowest possible amount of environmental threat through their transport, use and disposal. Fossil fuels are typically at the opposite end of this spectrum. They are a scarce resource, difficult and environmentally costly to refine and their use has a proven detrimental effect of our atmosphere. It is growing awareness of how our planet is coming under increasing strain that has catalysed ‘green initiatives’ the world over in the hopes of minimising further damage. Blue Forest firmly takes this on board, which is why we are openly committed to applying sustainable principles to the design and construction of our treehouses. This why buildings like the ecoPERCH have been created to be both aesthetically pleasing and to adhere to the fundamental concepts of green building. This approach involves multiple elements, from the process and the materials used, to the features within the structure, including facilities and appliances you might use in your own home, like low energy light bulbs. Building your childhood tree house usually meant banging some nails into wooden slats on one of the trees in your garden. You knew it would last a while but there wasn’t much longevity or planning that went into the build. With our luxury treehouses, we can afford to take more care choosing the tree, as well as finding the best, sustainably harvested wood so that your tree house can last a lifetime. The foundation of your treehouse is usually the tree you choose to build it around. Ideal varieties such as oak, maple, fir and apple are chosen because of their naturally strong trunks and branches and their ability to support weight. However, as long as any tree is healthy, mature and has well established roots it can be used for support a treehouse. One of the great innovations in tree house building, and something we employ in nearly all our designs, is that we don’t have to use the tree for major support. instead stilts can be erected to support the structure, putting minimal strain on the tree. The weaving branches and trunk then become a feature that your luxury tree house is built around, rather than it’s primary means of support. Not only does this mean the tree isn’t drilled into, it also allows the tree room to grow and change. It wouldn’t be worth building a beautiful treetop room only to kill or obstruct the wonderful tree beneath it. When building a treehouse it is impossible not to impact the tree at all. This is why it is so important to limit any harm caused during the construction. We rarely drill into the trees – as the lifeblood of the tree is in the layers nearest the bark. By following the tree’s form and working its unique shape into the designs, strangulation – cutting of circulation and damaging the bark – can be avoided. No long term damage – find a way of working with the tree expert. At Blue Forest we use sustainable wood (FSC) and materials in the construction of our luxury tree houses. We also try to use ultra-local suppliers and craftsmen to support the local community. LED Lights – These alternatives to your usual lights are well known and one of the simplest ways to keep your energy use and bills down, as they use 80% less electrical power than incandescent bulbs. Structural Insulation – Designing a building to retain heat means that less heat needs to be produced in the long term to keep off the chill and less energy is lost to the outside environment. This can easily be built into the fabric of the walls and lining of the treehouse. Double glazing windows have a similar effect, keeping your home insulated. Solar Panels – Also known as Solar Cells or Solar PV system – PV standing for photovoltaics. These panels are able to convert sunlight into electricity which can then be used to run appliances and lighting. Unlike solar panels as many of us know them, these even work on cloudy days as they aren’t reliant on direct sunlight. Grey water drainage – This is the water from your sink after washing up or from your shower. It can be re-used and filter through your internal system for you toilet, saving on wasted water. Grey water is unique in its reusability and can be fitted easily into most designs for treehouses. Sourcing materials: Blue Forest makes every effort to source materials from sustainable means – includes disposing on leftovers in a recyclable way. This combination of green procedures and systems allowed us to create the eco-friendly ecoPerch. By using these green and eco-friendly solutions, we have been able to create the Blue Forest ecoPerch. These buildings are highly-insulated and can be installed at ground level on on stilts so that you enjoy life at treetop level. The curved construct is double glazed to retain heat, uses low voltage LED lighting, an ‘‘A’’ rated LPG (or electric) hot water heating system and has provision for grey water drainage. 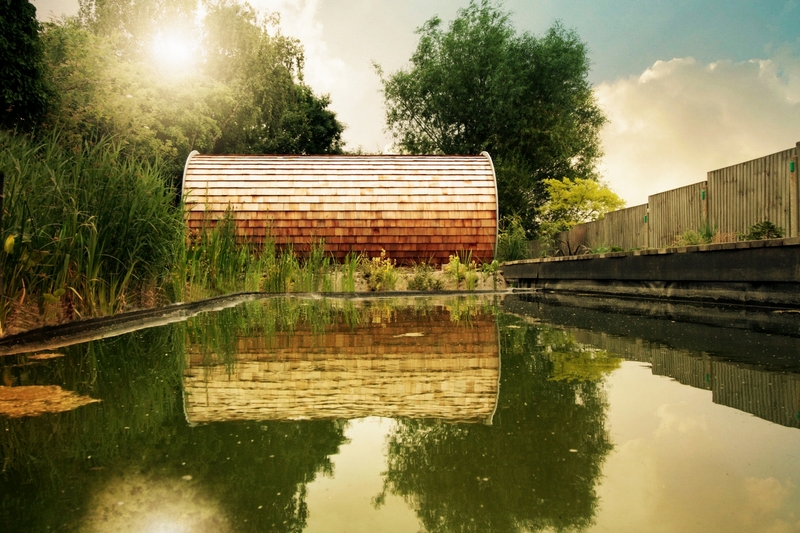 The ecoPERCH’s exterior is created using sustainably harvested tongue and groove timber cladding, roof shingles and outdoor deck. The stylish finish and unique design illustrates what can be possible with eco-friendly materials and smart, green, designs. Our recent headline-making collaboration with Quiet Mark, John Lewis and a range of other eco-friendly manufacturers, resulted in the Quiet Mark Treehouse – another great showcase of environmentally considerate treehouse design and construction. Read more about The Quiet Treehouse here.